Ethan Hawke is on point as 6 tour seasoned but now grounded pilot, Major Thomas Egan, assigned to fly drones in Afganistan from a remote Las Vegas Nevada air force compound. Day after day, teams of three sit in metal boxes on concrete slabs full of the latest modern technological warfare equipment, waging war on the Taliban. He meets a new partner, Airman Vera Suarez (Zoe Kravitz), who has little experience in the game but is up for the challenges that are built into the job. Ethan has a wife and kids and seems to enjoy being a family man with a house on the outskirts of Vegas. Wife Molly (January Jones), a former Vegas dancer turned mom, loves her husband but notices him distancing from the family as the ethical questions surrounding what he does for a living begin to weigh him down. She really doesn't have very much of an idea what he does, exactly but knows he is becoming tortured. His job is to keep watch on goings on, help protect troops on the ground, gather information and occasionally blow some folks off the planet as his direct superior orders. They follow strict protocols and procedures and take great care not to harm innocent victims. It is all very antiseptic and cold, overall, until his team is tapped to work with the CIA. The drones are precise, can zoom in, zoom back and spy on all sorts of activity up close an personal, and some of it is really unpleasant and borders on a voyeurism that snaps the crews back to reality. Unfortunately the CIA does not base its bombing targets on hard facts. Often the agency orders kills on "best information', which is not reliable, and innocents and children are sometimes taken out as well. Filmed in Morocco and New Mexico amid stark landscapes in 2014, the star is the cinematography. 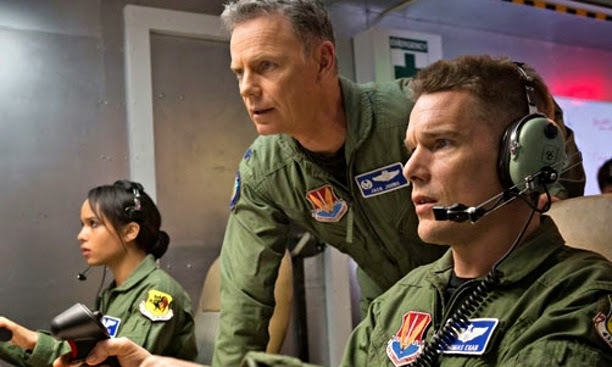 As the lines blur as to what it really takes to do this job (video gamer vs seasoned, highly trained pilot) the film brings to the forefront plenty of questions for viewer general discussion. Can hiding behind technology take the morality out of killing during wartime? How does seeing the aftermath of what one has directly done affect a serviceman over time? It is not hard to believe that the film is based on actual events. The tension is palpable and the dilemmas rolling around in their minds are painful to consider as we imagine what we would do in those chairs, taking blind orders to kill from one to fifty at a time. They say Good Kill on completion of each bombing yet ask themselves it a war crime was committed after a certain strike. They are clearly uncomfortable doing the CIA's bidding over speaker phone. The film possesses some great visuals and intelligent dialogue that all can follow. As Major Egan struggles, he becomes a little brooding, a little psychotic and quite a bit anxious and towards the end, has some serious personal choices to make. It is a difficult situation that begs the viewer to put themselves in his place and ask the hard questions.